Obesity, especially morbid obesity, is a major health problem with considerable impact on physical, mental and social quality of life. It is now estimated that more than 66% of the adult population in the US is overweight or obese. Bariatric surgery has become increasingly more common for the treatment of morbid obesity. 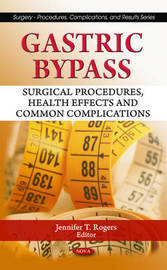 This book describes the main nutritional deficiencies and complications observed after gastric bypass, as well as prevention and treatment strategies of these deficiencies. This book also analyses the results of gastric bypass in the treatment of diabetes mellitus in a series of operated morbid obese patients. In addition, the Roux-en-Y gastric bypass (RYGBP) is well-known as the gold standard of bariatric surgery. The authors of this book examine this technique as well as other techniques which have been included in the range of therapeutic possibilities of bariatric surgery. A technique of laparoscopic sleeve gastrectomy with duodenojejunal bypass (LSG/DJB) is introduced as well as for patients at risk of gastric cancer. Other chapters in this book provide a brief review of the literature on the relationship between severe obesity in adults and suicidal ideation, suicidal behaviour and non-suicidal self-injury.